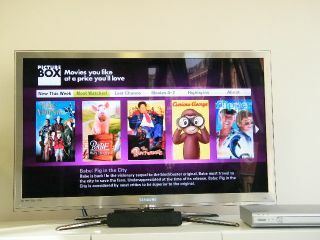 Will PictureBox be the first to stream 3D? Samsung has revealed that 3D movies are set to come to its internet connected TVs in the UK this year, and PictureBox is looking to be the first service to offer 3D movie content through its on-demand app. Samsung is no stranger to on-demand 3D movies. It recently partnered with Virgin Media to showcase the cable company's 3D offering but it has yet to pipe 3D films through its own app platform. This is set to change this year, with Darren Petersen, Content Services Manager - Smart TV at Samsung, hinting to TechRadar that we will see something in 2011. "We are hoping that 3D movies will be available [through Smart Hub] later this year," said Petersen to TechRadar. "The technology is there we are just waiting on our partners to come up with something." There is already 3D content on the Smart Hub in the US, with a number of apps offering 3D functionality – but there's no movies as of yet. PictureBox, a newcomer to Samsung's Smart Hub, is hoping that it will be the first of the partnered movie apps to stream a 3D movie, with a spokesperson explaining: "We are looking to stream our first 3D movie in Q3, but there's still a lot to do technology-wise. "We have to optimise the content for a number of different devices and this takes time."